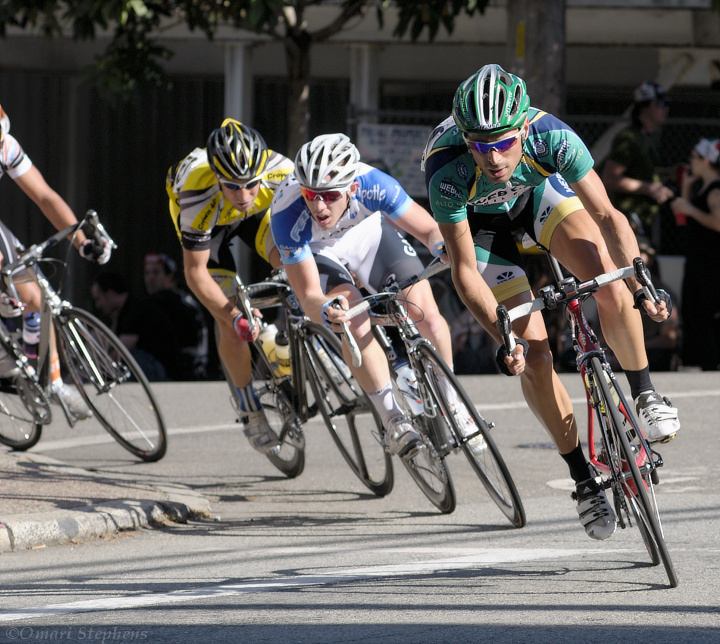 As I mentioned the previous post, I shot the Giro di San Francisco this past Monday (on Labor Day). To cut straight to the chase, I was surprised at how many good photos I had shot, and at just how good many of them were. Because this was a criterium rather than a road race, and because the buildings inside of the 6-corner urban course often prevented me from moving away from the riders, I had a tough time grabbing the tight, portrait-like shots that I got during the Fitchburg stage race. However, the wider crops really seemed to work well on this course. There were multiple categories racing on Monday. I got to the course just in time to see the tail end of the Masters' Cat 1/2/3 race. I shot the photo above as the riders were approaching the finish line. 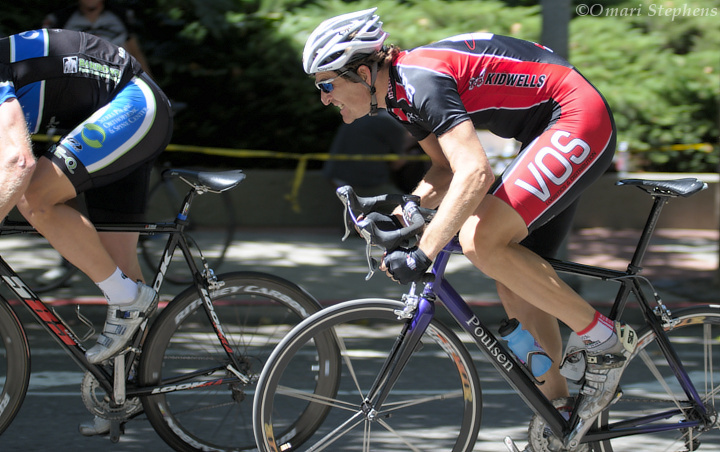 The VOS rider couldn't catch the person ahead of him, but held of the person behind to finish second. The exposure was 1/1000s at f/2.8. After the Masters' race, the focus of the Giro switched from the older generation to the young. 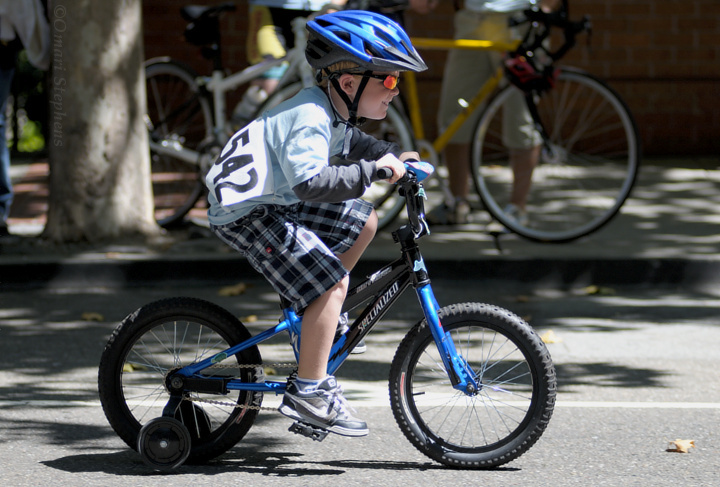 The youth races included a Skuuter class, a combination tricycle/training wheel class, and a bike class. During the tricycle race, this guy was a standout performer (he's clearly sandbagging ;o). I really like how excited he looks. This was 1/1250s at f/2.8. You can tell when a child has cyclists for parents, though, because they wear glasses and (in the case of some of the Skuuters, which was very cute) sometimes cycling gloves. Additionally, one of the kids in the bike class — I'd put him at 12 or 13 — was wearing clipless shoes. Sweet. After the youth races, the Cat 1/2/3 women were up. This was a fun race to watch, because there were a number of attacks, and there were a couple of reasonably-long solo and duo breaks. As for photography, though, I'm always a sucker for reflections. Once I saw the glass on the opposite side of the street, I started figuring out how to get a shot like this. Fortunately, I got one that came out well. One of the things I like about reflections is that it lets you fill the frame with the main subject, but still retain context for the image. I shot this at 1/1250s and f/3.5. I really, really, really like this photo. The trees were plentiful around the race course, which caused an interesting mix of sunlight and shade. However, the sun was so stunningly bright that a lot of light reflected off of the road, sidewalks, and buildings to provide much-needed fill light. The result is that, in my own opinion at least, the light was fantastic. This rider was off the front for a number of laps before being reeled in about half-way into the final lap. I recall the announcer mentioning that she had a number of time-trial accolades, though I can't remember quite what they were. That said, I really like this photo. It's pertinent (she almost won), it's pretty, and the panning is perfect. 1/1600s at f/5.0. All good things come to an end, though, and such was the case for the Webcor rider's sizable lead. This Cheerwine rider attacked the field a few laps prior and had been cutting large chunks of time out of the Webcor lead. Unfortunately for the both of them, though, the peloton whipped up the pace at just the right time to turn the finish into a group sprint. 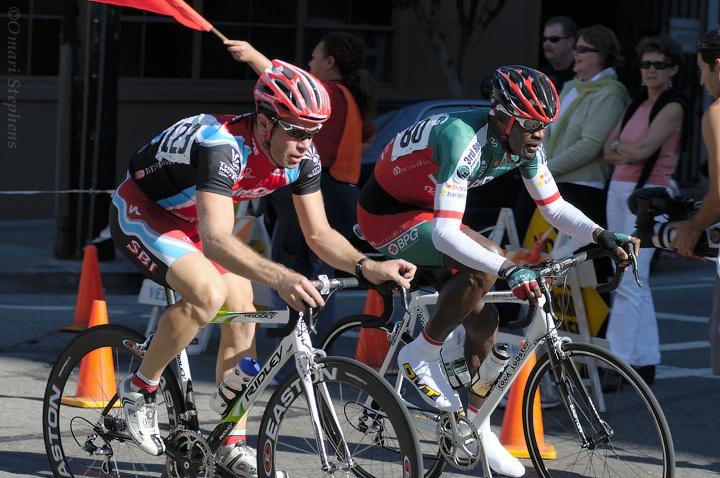 The image two frames ahead of this one shows the Webcor rider, the Cheerwine rider, and the tip of the peloton. Arguably, it's a better composition. However, the moment that this one captures, with the rider looking back at impending doom, is great. 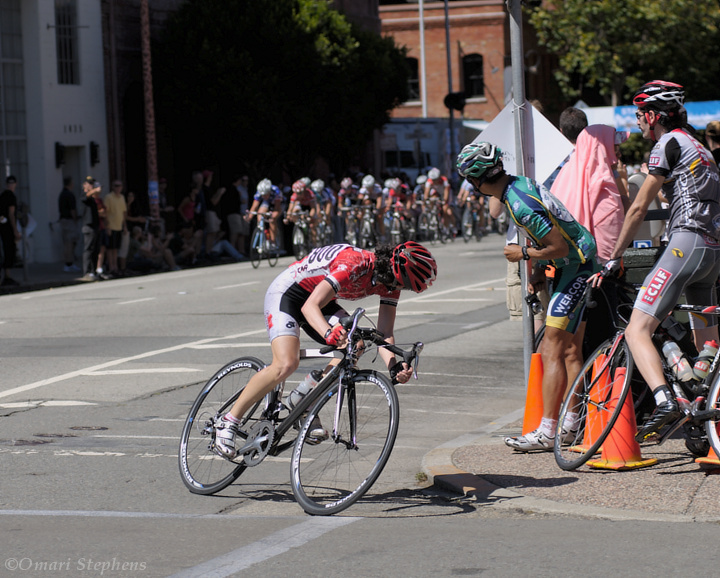 I think this is a moment that happens in a lot of bike races, but that few images that I've seen capture really well. That's why I like this photo so much. 1/1250s at f/4.5. Wow. But first, some background. 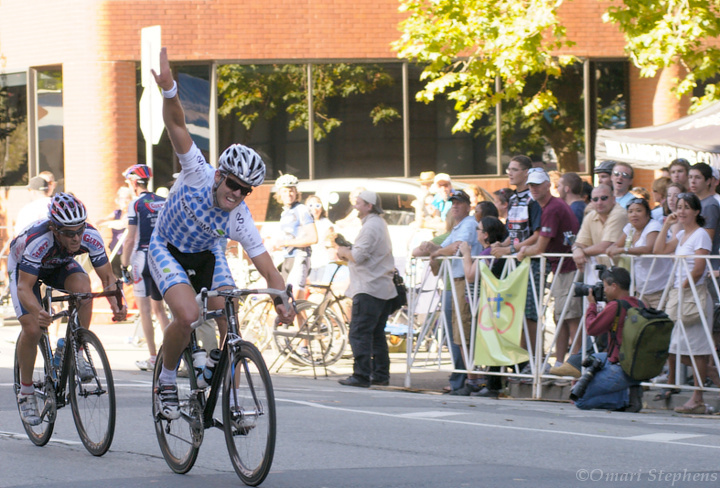 After the elite women finished up, the Category 3 men raced, followed by the Pro/1/2 men. I was ravenous by that point in the afternoon — that morning I had rushed out to catch the Caltrain (which runs hourly), so that I wouldn't miss the elite women's race, and as such, I hadn't eaten anything to that point. So I found food and ended up missing a good deal of the Cat 3 race. I did see the last couple laps, though. That said, I was surprised by just how much faster the elite men's race was than any other race that day. I didn't have much luck shooting from the inside of the corners simply because they were hitting the corners so hard. Fortunately, TMTOWTDI. This turn is coming off of a block-long hill, just before the long back stretch. The lighting that I mentioned before really makes this shot, I think — the shadowed details are crystal clear, and the light is really well-balanced, unlike most harsh-sunlight photos that I've taken without flash. 1/640s at f/5.0. But wow. In a single photo, I think this captures the entire day of races pretty well. The officials were hard at work all day, keeping spectators off of the course when the racers were coming through (which was often tricky, given how little visibility there was around the corners). And given that there were 55 laps of the course in the men's race alone, they were a big part of the success of this race. Also, the spectators were out in force. The sidewalks near the start/finish were lined with people, and there was a crowd at every corner. It wasn't quite as jam-packed as the Philadelphia Championship race, but it certainly comes second. Lastly, there were a lot of folks shooting and taking videos. There were a lot of photographers sporting multiple bodies and huge lenses (400mm f/2.8, anyone :o). Unfortunately, I didn't have my D70 handy, or I would have joined them; being able to quickly switch from my 80-200mm to the 18-70 would have been very helpful. Regardless, I think things turned out well. This was 1/1000s at f/5.0. The end of the elite men's race saw an eight-man break whittled down to two riders vying for the win. One of the six who didn't make the cut was still off the front, though, until the final lap. The announcer mentioned that this might be one of his last races, and got the few-hundred people near the start finish to cheer as he went by, just ahead of the peloton. The cheers were dying down as the peloton crossed the line to enter their final lap. At the head of the chase, This Metromint rider was doing his best to raise the roof and garner some crowd support for the chase group. I found it interesting, given that he was at the head of the peloton and clearly hurting because of it, how much energy the Metromint rider put into trying to excite the crowd. I think this photo sort of captures the odd dichotomy between putting everything in the race and getting the crowd involved. 1/400s at f/5.0. So that's it for now. I really enjoyed shooting the Giro di San Francisco, and I definitely think I improved and managed to nail some great shots. The best thing about bike races, though, is that they happen a lot :o) I'll be shooting the San Francisco Twilight Crit this weekend; it should be a good time. The night/streetlit aspect will certainly provide for some interesting challenges, so we'll see how it goes.